As of R1 2017 through the new ShowToolTipOnTrimmedText property you can specify whether or not a tooltip should be shown when the text of a given cell exceeds its parent column's width. It can be set on both RadGridView and column level. The ShowToolTipOnTrimmedText is applied to RadGridView's GridViewHeaderCell, GridViewCell and GridViewFooterCell elements. Setting it to True will result in a tooltip being showed if the cell's text is trimmed. 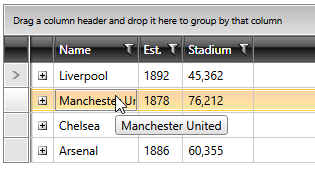 Setting the ShowToolTipOnTrimmedText of a column will show tooltips for trimmed text only for the given column. Setting the same property of a RadGridView instance will set the ShowToolTipOnTrimmedText for all of its columns. If you set the ShowToolTipOnTrimmedText on both column and RadGridView level, the value set for the column will take precedence. Tooltips will be displayed in RadGridView's footer row only if the content of the footer is either a string or a TextBlock.